Save money, without thinking. Try Digit for Free. What can be big or small, can creep up on you in broad daylight or at night, can be scarier than a horror movie villain, and is soon something Digit can help you conquer? Credit card debt! Credit card debt can be stressful — stressful when some debt has built up (I'm looking at you, new apartment furniture...) and stressful when you're trying to climb your way out. It's something millions of Americans are dealing with... to the tune of almost a trillion dollars. Digit Pay cuts out all those steps. Turn on Digit Pay, and the savings Digit puts aside for your credit card goal each month will be used to make an extra payment to your credit card. You can now can chip away at your credit card debt while you sleep. Or while you enjoy your morning coffee. Or while you crush a workout. Or while you hone your next talent. Because Digit Pay means less work for you, and more time to do the things you care about most. It also means you'll be on the fast track to getting out of debt. Here's a secret credit card companies don't want you to know: a little goes a long way. For example, if you have $5,000 in credit card debt, an extra $100 a month payment could save you $2,000 in interest and make you debt free in 30 months compared to 80 😮! Digit Pay will be rolling out slowly over the next few months. Reserve your spot today. More savings. Less debt. Let's do this together. Today we’re introducing Boost. Want to fast-track your goal? Just Boost it! 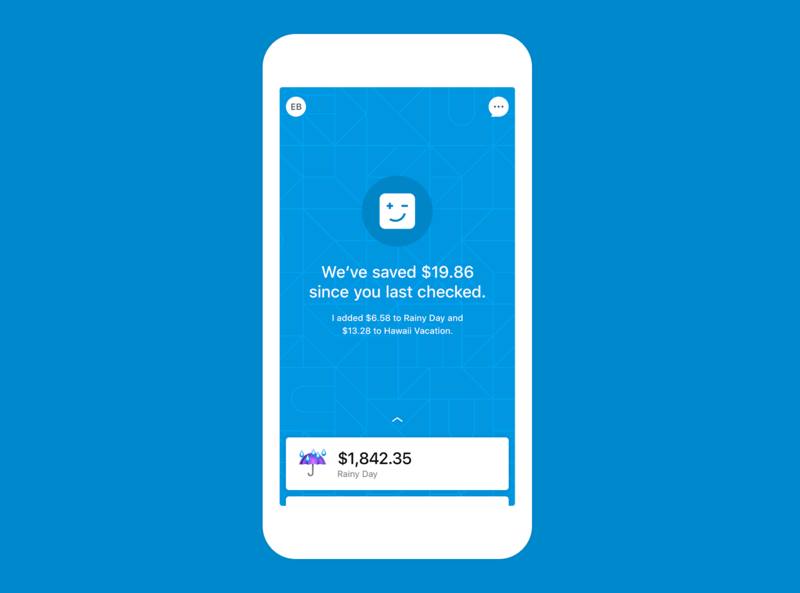 Digit will save more money, more quickly while still adjusting to your financial life in real-time — always ensuring you have the money you need for day to day expenses. We've designed Boost to fit the needs of the savings reality most of us face. Some months we have more money and some months we have less. Trying to save more in this uncertain environment can be hard and stressful. With Boost you can safely save even more money, effortlessly. Today we're launching Low Balance Protection so you can worry less about overdrafts. With Low Balance Protection, Digit automatically transfers money to your checking account when your balance drops below a certain level. Overdrafts cost us $15 Billion a year. We hope to put some of that money back into your pocket with Low Balance Protection. It's one more way Digit has your back. Digit has reached some big milestones in a pretty short time, yet we've already outgrown some things we thought would be with us forever. There's that old filing cabinet we held onto way too long, dragging it from one office to another as we grew, even though there were never any files in it. The original office itself (yikes). And our ritual of playing Saboteur at lunch, which we finally had to admit wasn't a great idea anymore because it often resulted in things getting too competitive. But now we're really changing things up, killing off what was once our sacred cow — a Digit experience built on messaging. We've redesigned our app with a graphical UI to make everything clearer and more intuitive. The old conversational UI is still there, in the background. But all the functions you want are now on tap, not commands to type. And we're happy to admit openly what we've long considered quietly — chatbots aren't the answer for keeping an eye on your money. In fact, we'll go so far as to say the promise of chatbots is dead. That is, if the potential we envisioned for them was ever truly alive. The technology to make AI-powered assistants truly useful is still far out of reach, and people shouldn't have to close that gap by adapting their behavior. Which is why, after years of being told chatbots are the future, there's still no killer app to prove it. Others seem to agree. The end of Facebook's M would seem to signal that this path has hit a dead end, at least for consumers. More broadly, there's been traction with B2B chatbots. But unless we count real, live conversations with voice assistants, like Echo and Google Home, conversational UI has proven limiting for consumer product interactions time and again. And even those interfaces are, for now, too rudimentary for most people to use them comfortably for money matters. Still, there was good reason to believe in it when we started. We were creating a personal sidekick that made saving so easy you'd never have to think about it — why not make it work like a real-life assistant? While that helped people get used to a robot handling their money, “not thinking about it” took on a different meaning as Digit evolved. People began to expect Digit would understand a lot more direction than it was equipped for. The better we got at helping people with finances, the harder it was for our chatbot to keep up. And we've always been about rejecting conventional wisdom, even if it's our own. If we're being generous with ourselves, embracing this shift puts us in pretty good company. Beloved consumer products like Venmo and Twitter were originally available only via SMS, then adapted to more conventional interfaces as the needs of their users outpaced their purposeful simplicity. The lesson, of course, is that if you're trying to make people's lives better you can't put style ahead of substance. You've got to be in love with the problem, and not a certain solution. We see our job as helping people get the most out of their money with the least amount of effort — not advancing new paradigms. Moving to a graphical UI sets us up to focus our resources on the outcomes customers want, rather than reinventing the interactions that get them there. We'll continue to let them teach us how best to deliver on our promise to them — because we're not afraid to change our minds again if it's the right thing to do. One question we hear a lot from customers is “why do transfers take so long to complete?” And the truth is, we've always thought it should be faster too. It's simply been a certain way for so long that a lot of people kind of accepted it. Now, we're not the first to think things should, and could, change. But we felt like there was still a lot of room for improvement and decided to do something about it — in a joint effort with a couple of the country's largest, most established banks. Now all Digit transactions with Chase and Wells Fargo on business days before 6pm ET — automatic and manual, saves and withdrawals — will process fully the same day. Often, within just a few hours. And that means our customers who bank with them can move money where they want when they want, whether that's back in their hands or safely put away in their Digit savings. The way it should be. Working with some of the biggest names in banking to change industry processes is a special milestone for us. It shows what's possible when start-ups and stalwarts join forces for the good of their customers. We can't wait to extend same-day transfers to additional banks, and we'll continue looking for new partnership opportunities that make it possible. Because when it comes to making personal finance fast, frictionless, and feel-good, we're all in it together. Curious about what Digit has done for you lately? Just ask! You can now message Digit, “What did you do for me today?” (or keep it simple with just 'Today'). In response, Digit will let you know what got saved that day. And if Digit didn't save for you, it'll tell you why. 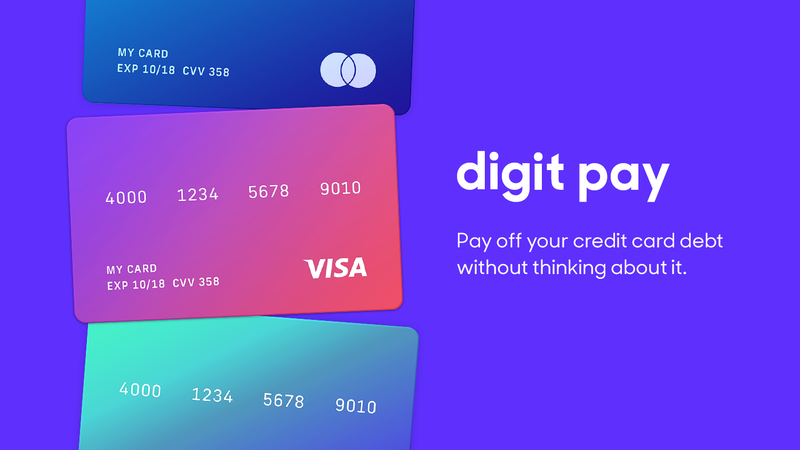 As Digit becomes a more important part of our customers' financial lives, we’ve decided to make a conscious decision about how we want to make money. Too many financial services complicate things by making money doing things not in the best interest of their customers. Charging for Digit will allow us to support our service while making sure we always do what’s right for the customer. We are also significantly increasing the Digit Savings Bonus. All customers will now earn a 1% Savings Bonus (up from 0.20%). 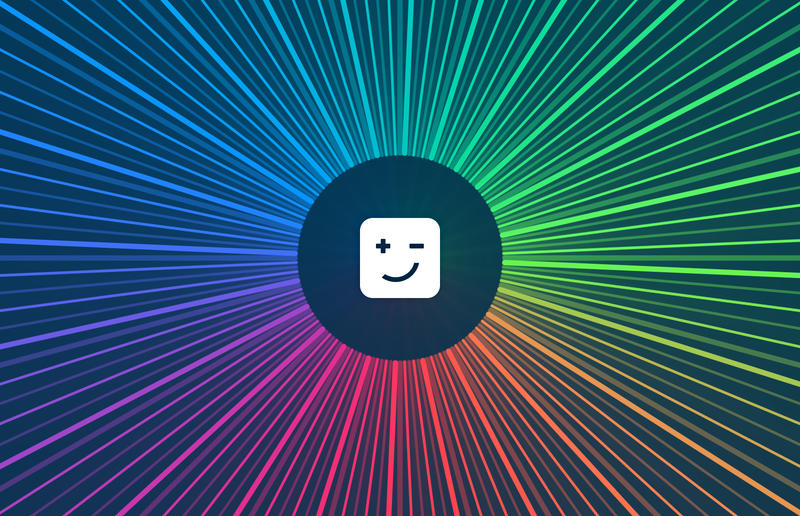 With the recent introduction of Goalmojis, customers are saving more than ever, and we want to make sure you're earning real rewards for saving with Digit. We want to give a huge thank you to all of our early users, believers, and fans. You have sparked the savings revolution. We promise to continue building products that make your financial life easier and better. 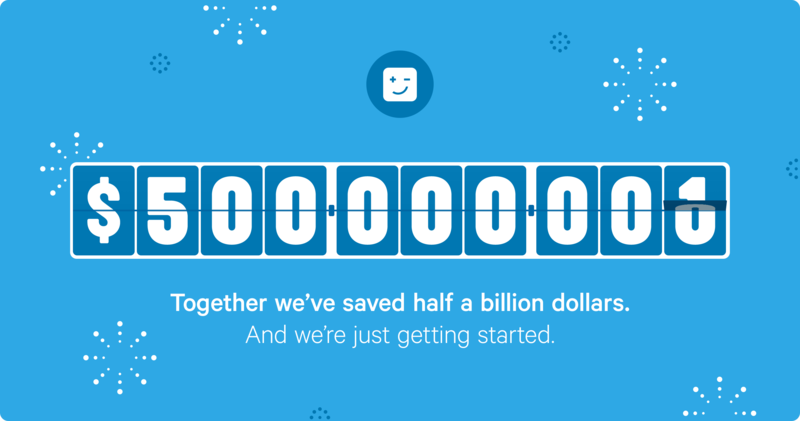 Let's take a moment to celebrate: together we’ve saved over half a billion dollars! And let's be clear, saving is hard—one third of Americans don't have any savings—but our goal at Digit is to make achieving financial health effortless. Whether it's through paying your bills on time, setting aside money for your upcoming vacation, or just saving for a rainy day, we're going to continue building a future where you can focus on living your life, and Digit will handle your finances. Thanks for being a part of the savings revolution with us. Here's to the next 500 mill! Today we’re excited to make saving for anything in your life easier with Goalmojis. Goalmojis allow you to tell Digit to save for your rent or electricity bill, for your wedding, for a trip to Disney World, or anything else you need money set aside for. Using the latest advances in machine learning and personalization, Digit figures out and saves the perfect amount of money for your goals every day. 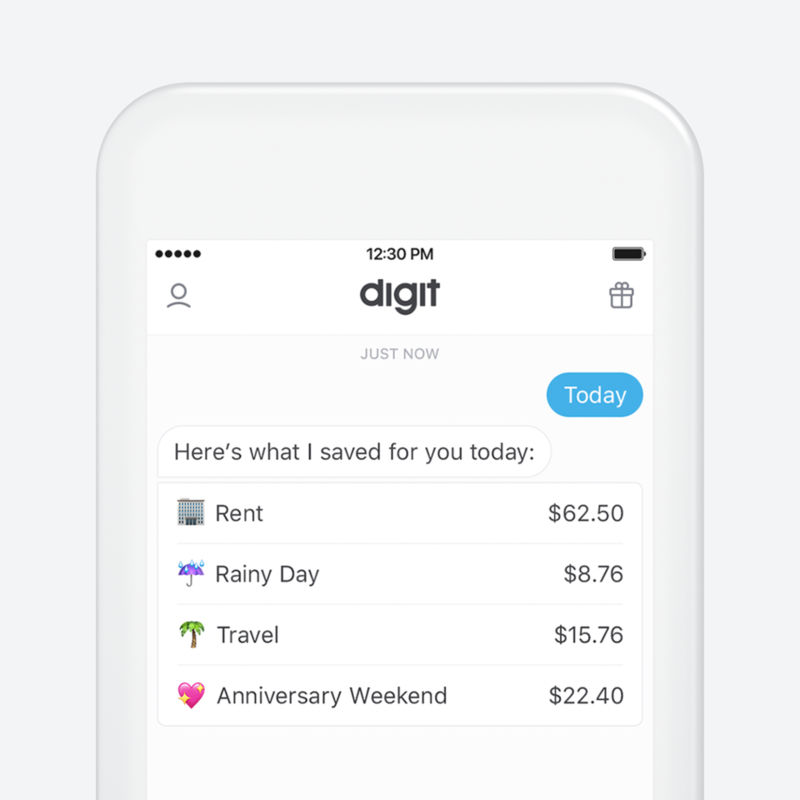 Over the last two years, Digit has focused on kickstarting savings, by setting aside money for a rainy day. Starting today, with the introduction of Goalmoji, Digit is now the best way to save for anything. 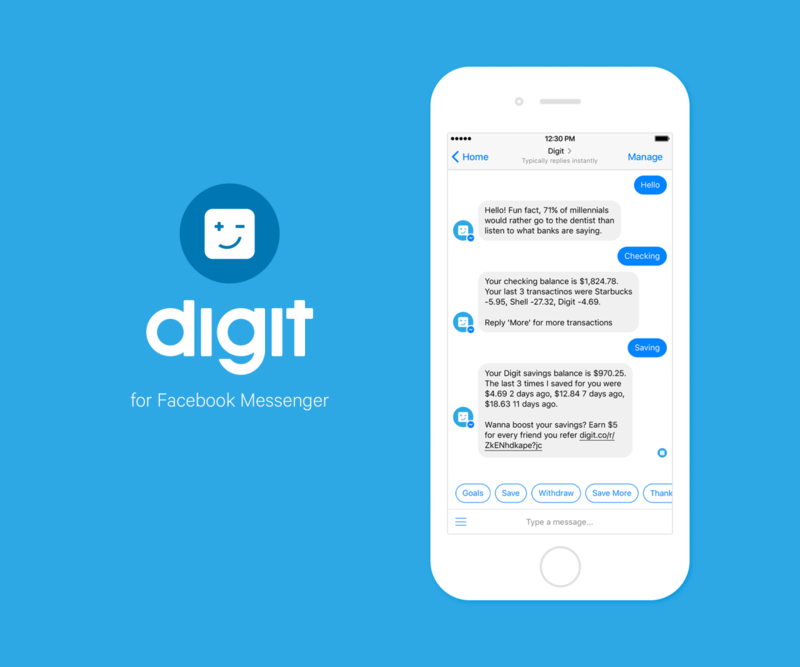 Today we’re introducing the Digit Messenger Bot. © 2017 Hello Digit Inc.